This online Nursing Assessment and Physical Examination Refresher and Clinical Update continuing education course will teach you skills including integumentary, HEENT, abdominal, cardiovascular, respiratory, neurological, musculoskeletal and genitourinary assessment. 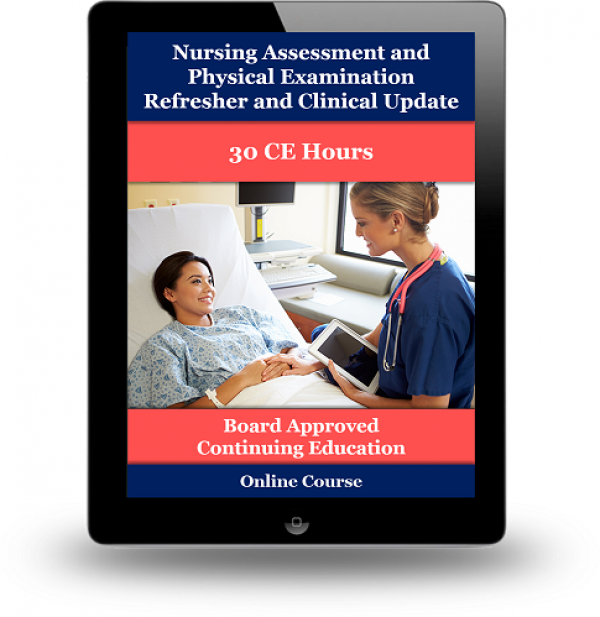 This course is an easy-to-use, cost effective resource that can assist you in meeting your continuing nursing education requirements while helping you improve your job performance, increase confidence and enhance the care you provide to your patients. This course can also help nursing students meet their academic challenges and succeed in nursing school. Study at your own pace, in the comfort of your home or workplace. National Healthcare Institute (NHI) is an approved provider of continuing nursing education by the California, Florida, District of Columbia, Georgia, South Carolina and Iowa Board of Nursing. All CE courses offer by National Healthcare Institute follow the standards recommended by the American Nurses Credentialing Center’s Commission on Accreditation for this type of educational activities.